Itum Bahal is also known by its full name Shree Bhaskardeva Samskarita Keshchandra Krit Paravart Mahavihara or Keshchandra Mahavihar for short. It is said to have existed in one form or another since the 11th century. However, many of the buildings there today are from the 13th century. 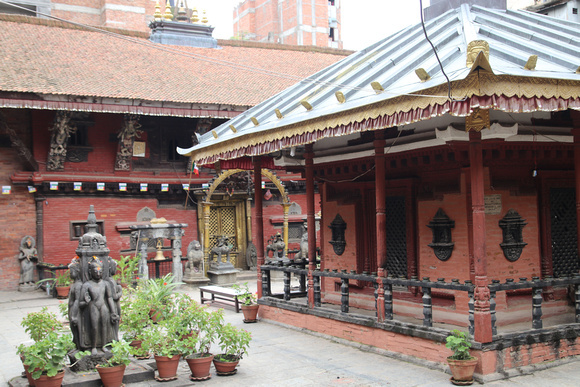 It is recognized as the largest Buddhist Monastery in Kathmandu. The main Itum Bahal complex is larger than it may first appear. It consists of a large rectangular central courtyard. Within this area are several bahas (monasteries), nanies (Newari courtyards) & chukas (small lanes), a museum and other buildings of note. In each main area are many shrines, an assortment of different chaitya and inscription pillars. The main Itum Baha or monastery is tucked away in its own courtyard. Most areas were damaged in the 2015 earthquake with Itum Baha itself now fully repaired. There are several entrances to Ituma Bahal however the two mains ones are to the north and south. The northern entrance along is Kilagal street which is the easiest to find if doing a heritage walk. To the south is a tiny well hidden arch way from Chokachen street. Itum bahal contains many hidden places and stories to discover. It’s well worth reading a little to take it all in before visiting. Let's discover more about Itum Bahal below! 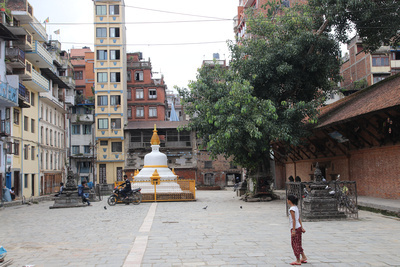 Itum Bahal is located in Kathmandu’s old city in ward 26 – about half way between the tourist hub of Thamel and Kathmandu Durbar Square. It’s a relatively short walk to reach the famous monastery but one that can be made all the better if you do it with a heritage walk. Although the main entrance is along Kilagal street not many people will know the name. Kathmandu also has a shortage of street signs. A far easier way to find Itum Bahal is again by following a heritage walk on a map or simply by asking locals in the area where “Itum Bahal” is. Everyone in the area knows Itum Bahal. Along the same street (Kilagal) are several other landmarks worth visiting and indeed enjoying. The first is the main street itself which is a market street filled with spice, mineral and vegetable sellers. There’s a red Pulu Kisi (elephant) perched high on a wooden stand and a white Pulu Kisi building further down which are associated with the annual Indra Jatra festival. There’s also a large Ganesh temple and beside it a small newly renovated Lokeshvara shrine. Opposite these is Koti Mahadev complex which consists of the only Shiva temple in Kathmandu with bricks containing Shiva lingams. Just ahead of Koti Mahadev to the left is an opening with slope leading to a large open square – this is Itum Bahal. Much of Itum Bahal’s history evolves several legends that culminating in the main monastery being constructed. Most of these legends come from the early 12th century. However here are some who believe Itum dates back to Emperor Ashoka (268 – 263 BCE). This coincides with people who speak of Itum as a location with a population living there long before any monasteries were built. It’s highly likely Itum was a trading area similar to Kasthmandap which came into existence three hundred years prior to Itum’s legendary beginning. Indeed judging by historic documents it would seem as if Itum was an extension or a forerunner to the main trading areas that would soon form Kathmandu. The most popular legend that many say in one form or another brought about the first monastery revolves around its excepted founder Keshchandra and a story about a monster. Most of this story was verbal however there are some murals inside the monastery, brass plaques outside along with some artifacts. Some parts of this story change depending if you talk with members of Itum Bahal monastery or people living in Itum Bahal complex. However both overlap. The story goes that Prince Keshchandra, who lived in the area has a bad gambling habit using dice. So bad was his addiction that he lost all his money. 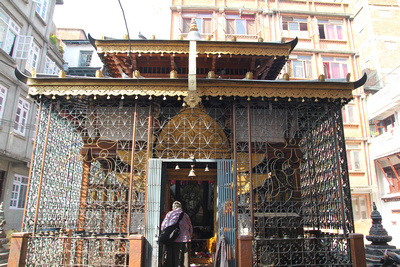 However his sister had married a wealthy man Bagwanbahal (North Thamel). When she served him a meal from golden dishes it didn’t take long for Keshchandra to steal them and place them on a bet. He lost the bet. Keshchandra returned to his sisters house and claimed he was innocent of the theft. That night she fed him from silver plates which also went missing the next day. Keshchandra lost another bet and with it the silver plates. Returning to his sisters house whereupon she scolded him for taking her dishes. Using bronze plates she served him dinner. Yet again the dishes went missing as Keshchandra gambled them away in a lost bet. Returning to his angry sister once more he allegedly asked for her help but she was furious at her brother. For dinner she served him the rice meal on the floor. Disgraced at this action Keshchandra placed the food in a cloth and left his sisters house to the nearby jungle. Depressed and feeling desperate Keshchandra rested by a tree for several days. Becoming hungry he unpacked the food only to discover it had become rotten. Keshchandra spread the food out under the hot sun to dry it out in an attempt to recover it before going to sleep. When he awoke Keshchandra discovered that pigeons had eaten all his food. Completely devastated at losing all his food in the middle of the jungle with the prospect of dying Keshchandra began to cry heavily before falling asleep. The pigeons who had eaten the food felt sorry for Keshchandra’s plight and turned their droppings into gold to aid him. Keshchandra woke up surrounded by gold and rejoiced. Having seemingly learned his lesson Keshchandra vowed to use the gold to constructed a monastery while also to never gamble again. However the gold was too heavy for Keshchandra to carry alone. As he pondered on what to do a monster called Gurumapa appeared threatening to kill Keshchandra. Fraught with fear Keshchandra persuaded the monster that he was a friend and they should remain so. As part of his plea Keshchandra asked Gurumapa to help carry the gold back and in exchange he could stay in Itum and eat there as a welcome guest. Gurumapa agreed and they returned to Itum together where upon Keshchandra honored his pledge to build a monastery called Bhaskardeva Sanskarita Keshchandra krita Parawarta Mahavihara. During this period all was still not well as Gurumapa had developed a taste for eating the neighborhood children. So distraught were the residents that they often told children “be silent or Gurumapa will get you”. Sadly Keshchandra’s own son became a victim of Gurumapa’s eating habits too. Faced with a revolt from the residents of Itum, Keshchandra took Gurumapa to the open field at Tudikhel where he left him with the promise of huge feast there every year if he stayed away from Itum. Every year since there is a feast of rice and buffalo meat at Tudikhel held to satiate Gurumapa. Thus the history of Itum Bahal favors the legends of the man that build the monastery and the monster who may well return if not fed every year. 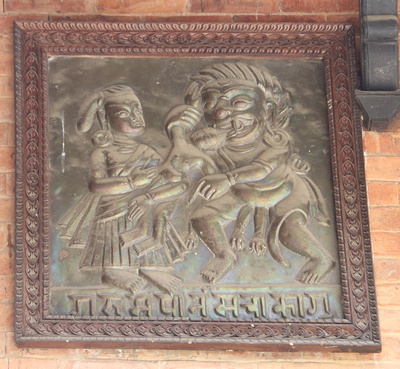 Bronze plaques line the northern wall of Itum Bahal depicting this story. Entering through the northern entrance the main open courtyard looks rather bland. Grey stone lines the long rectangular area while a ramshackle metal shelter blocks the pleasant open view. The metal shelter was using during the 2015 earthquake to house relics from Itum Bahal but seems to have being more permanent in nature recently. To the left are some black stone chaitya while to the right is the first of several nani you can visit. The first courtyard is Saraswati Nani dedicated to the goddess of wisdom, learning and eloquence. However some historians point out it is in fact Manjushree who is also regarded as a god of learning but often confused with Saraswati. On this occasion the brick shrine is largely acknowledged as being dedicated to Sawaswati. Coming out of the first nani take a right and walk up the main open courtyard to the next small lane leading to another nani. This slightly larger nani is dominated by a large metal frame that surrounds a brick shrine dedicated to two women saints known as Green Tara and White Tara. Both women were reported to be real princesses from Nepal and China who married a 7th century Tibetan king. The statues inside the shrine are that of the Yellow, White and Green Tara. Where the yellow Tara comes from nobody is quite sure though many speculate it’s a representation of Lord Tara (Goddess of Wisdom). Tara nani has one more surprise. To the left is a red well which is said to be the areas main water source. It’s also said to house a powerful Jwala nag which is can bite anyone in the Kathmandu Valley! Once you leave Tara Nani continue walking up the main Itum courtyard until you reach a large tree and a large white chaitya surrounded by smaller black stone chaitya to the left. The tree is known as a tree of life. Colorful string is tied around it at the birth or death of a loved one. The large white chaitya is often referred to as a stupa. However as it does not contain the relics of the Buddha or been blessed as a stupa it is in actual fact a large white chaitya. There are many of these around Kathmandu and although not technically a stupa remain impressive. There’s a large wooden door to the left which is the entrance to the actual Itum Baha. The wooden entrance to Itum Baha was severely damaged in the 2015 earthquake but completely repaired in 2017. Inside is a square 24.95 meter× 24.85 meter courtyard. At the center is a square shrine inside which sits a small votive chaitya which looks very like a Shiva lingam. To left are some very well preserved Buddhist chaitya along the southern wing of Itum Baha. It’s here that the Free Itum Clinic is located which serves the local community. To the rear is main entrance to Itum Baha. 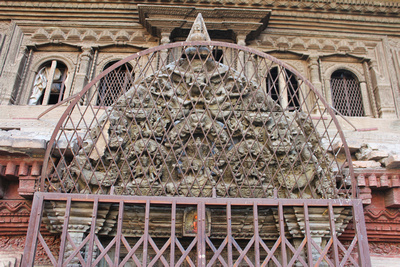 The golden gates are guarded by two stone lions and two metal lions. Besides these are taleju bells and host of smaller statues and mandalas. The Santum Santorium houses a statue of Akshobhya Buddha facing east. To the right of the gates is the norther wing of the baha which deserves some attention. 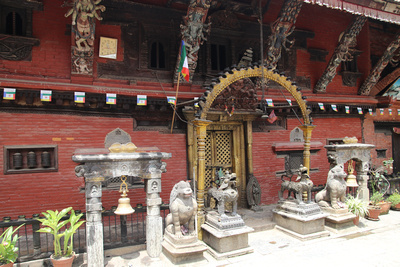 Running along the middle part of the wing are brass plaques depicting scenes from this history of Itum including that of Keshchandra and Gurumapa. Further along and you should be able to gain access to the northern wing where several relics are stored. 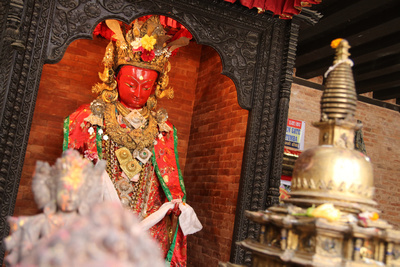 There’s a large red statue of Keshchandra though several outside the monastry say this is Adju Dya the goddess of Gambling (gambling Aaju dya). The most impressive relic is that of large metal stupa which closely resembles Swayambhu. There are also several smaller relics including tools recovered from the inner monastery. Perhaps the monasteries finest relic is that of a golden window from the original monastery at Itum which is said of have been rebuilt on at least three occasions. Come back out into the main Itum complex courtyard. The last nani to the left is a very small one housing a concrete shrine with a votive chaitya inside. To the rear you can walk out and around the back of Itum Bahal all the way to Kigali street. Or equally reach several more smaller courtyards which are located to the rear of the Saraswoti Nani and also mentioned below. Back in the main complex courtyard and to the right at the end of the courtyard is a building being reconstructed. Degu Dya or God’s house contains a secretive god brought here by Kashcendra. It also once contained one of the most intricate toranas above the doorway. It remains to be seen if the original reappears or a substitute is placed there instead. To the left is an old museum badly damaged by the 2015 earthquake. To the right is a small archway which many say is the original entrance to Itum Bahal. So far there have been three main nani’s visited in Itum bahal. There are several more though they are well hidden from the main courtyard. K-gu Nani and be found to the rear of Saraswati nani and behind that is Pasa nani. Both nani’s contain votive chaitya and can also be reached via Kigali street. There is no accommodation directly attached to Itum Bahal. The closest accommodation is located in Thamel or Paknajol. Aside from a very small roti shop at the norther entrance there are not restaurants or shops inside Itum Bahal. The main tourist hub of Thamel is very close for an assortment of international themed restaurants! 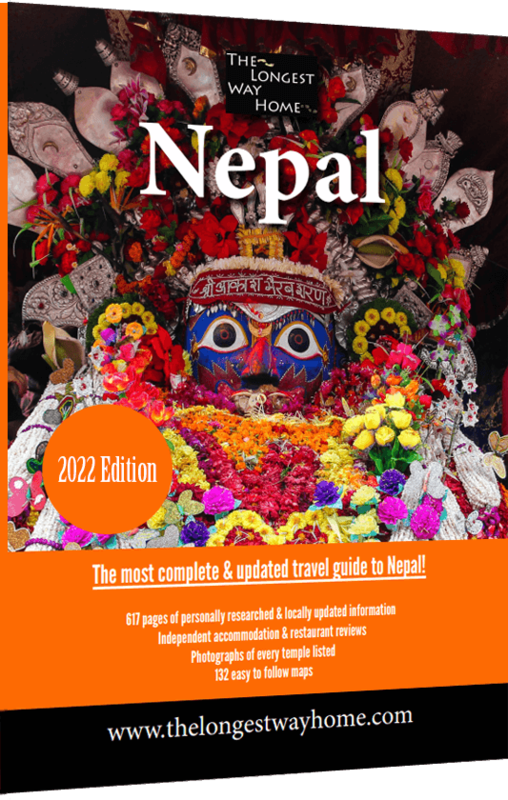 My guidebook to Nepal has extensive reviews of all the best places to eat in Thamel for all budgets - I pay for everything (no sponsors), so you you know the reviews are 100% genuine. Directions to Itum Bahal can be found above. The map below will show you the location in Kathmandu city along heritage Walk II (maroon color). The diagram of Itum is an extract from my book Kathmandu Valley Heritage walks. As mentioned previously the unique Koti Mahadev temple is beside Itum Bahal and is certainly worth a look. Outside along Kigali street are interesting markets from vegetable sellers to late afternoon snack shops, spice and mineral markets. 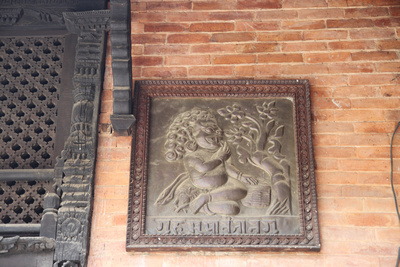 Also along Kigali are several small nani’s leading into Newari style courtyards – though do note these are private residences so respecting peoples privacy is important. At the west end of Kigali street is the large Nau Dega temple sitting high atop several red-brick platforms. To the east of Itum Bahal along Kigali street which follows heritage walk 2 in my book is the impressive Naradevi temple. 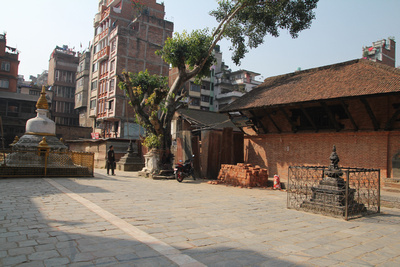 Taking a left here leads further into the heritage walk 2 leading to Kathmandu Durbar Square. Download my Guidebooks for the best in heritage walks! Liked this page? You'll love my books!